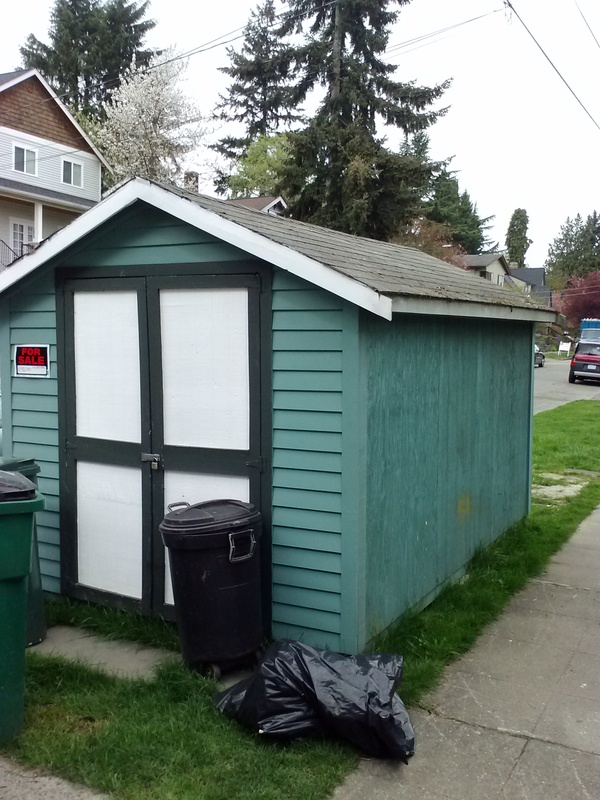 Many thanks to Greg Meyer who spotted a shed for sale (see photo). Greg took an extra minute to write down the pertinent details and forward them to us. 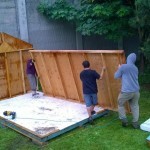 When the owner, Andy Farr, found out that it was for a community orchard, he donated the shed! With the generous services and direction from Craig, we had the shed moved to the orchard and reconstructed within four hours. Thanks to Renee, who took an extra minute to find us a strong young volunteer, we had enough muscle power between Fernando, Tracy, Craig, Andy, Justin, and Nancy. Craig also took an extra minute at Aurora Rents to explain why he rented a compressor. Aurora Rents waived the rental charge! We are so happy we don’t have to haul cardboard and burlap between our houses and the orchard. We hope to get funding to rebuild the roof this fall. The result will be more standing headroom, light and ventilation, a larger roof to support water catchment and to shield our communications board from weather. Bring a chair. It’s a potluck. Where will that funding come from? 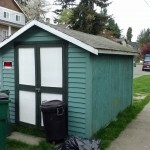 We are still keeping our fingers crossed for another Seattle Neighborhood Matching Fund grant. Our grant application was first reviewed in detail. Then, in June, Nancy and Michelle did a wonderful job putting together a display of our project and pleaded our case in front of 30 or so members of the Citywide Review Team. There are now three more tough hoops to jump through, including a review by Mayor Murray. 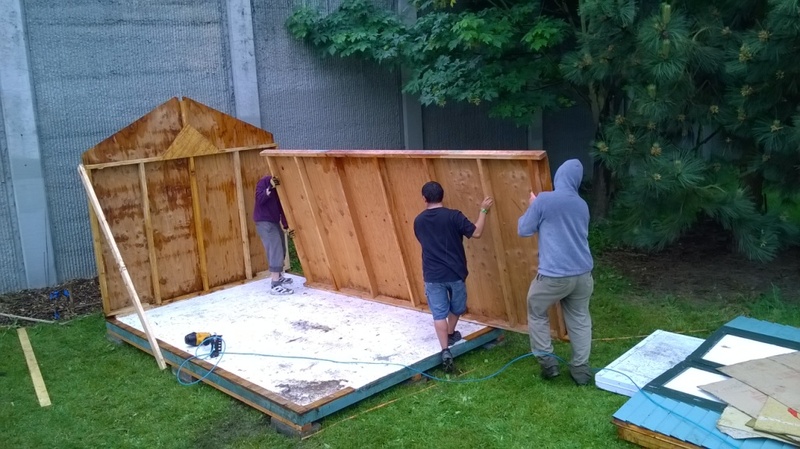 If we make it all the way through the City Council vote, we should hear by the first week in August whether we would have funding to bring water to the site, add a path, rebuild the shed and build garden beds. Meanwhile, we are starting to harvest! 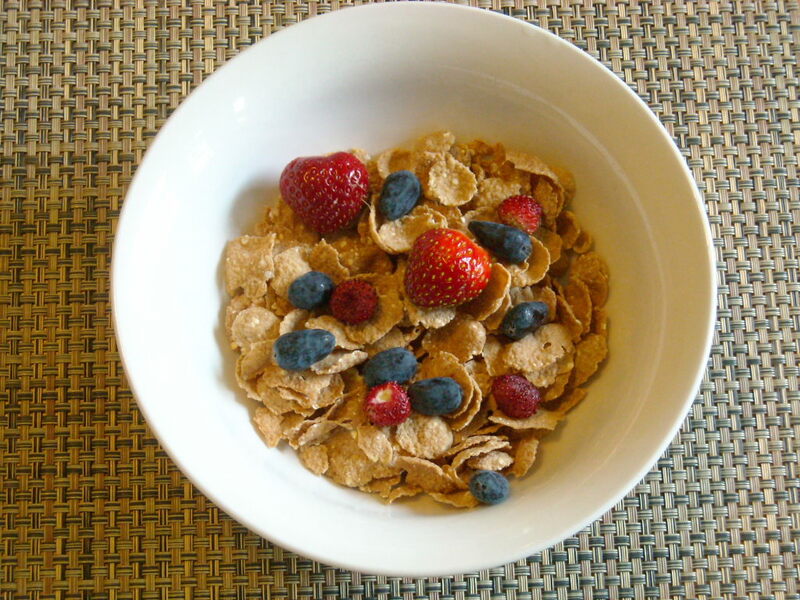 Several volunteers are having the breakfast of champions, adding honeyberry, five types of strawberries and now blueberries on their cereal this year (see photo.) 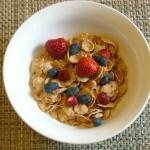 Two varieties of strawberries are day neutral and we should enjoy them the rest of the summer. Day neutral does not mean the berries don’t care what day it is. Different plants flower depending on the daily length of uninterrupted darkness. Plants are classified into three categories: short-day (long-night), long-day (short-night), or day-neutral, depending on their response to the duration of light or darkness. Short-day plants form flowers only when day length is less than about 12 hours. In contrast, long-day plants form flowers only when day length exceeds 12 hours. We also have fall bearing raspberries, Tulameen and Heritage, in addition to the June bearing Willamette. Finally, best of all, look for a few apples this fall! This entry was posted in Grants & Fundraising, Plants and tagged Berries, day neutral, funding, grant, shed on July 3, 2014 by Ruth.